What to do to keep busy during the long cold dark days? Kooooool winter crafts for kids KKC style of course to stir your imagination. In some parts of the world this is the season when you think of building snowmen and catching snowflakes. Skating on icy ponds and riding on snow sleds. Fun, fun, fun! But if the snow doesn`t come, what then? You can still use your creative imagination to make a wintery day come to life. How? Keep reading! Make a snowflake from paper. Craft kits are always in demand and there are so many to choose from. 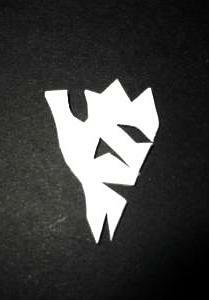 They are OK, but if you get some white pretty paper, fold and cut it, you can make some dazzling snowflakes. It can be hard to cut folded paper, so get the thinnest paper you can find. White tissue paper will do the trick. 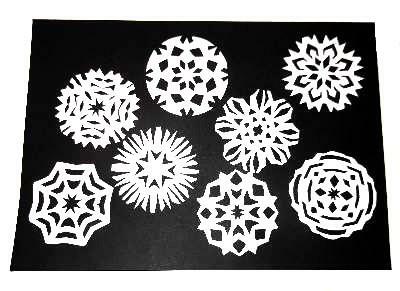 To make a snowflake display on a black background you will need one sheet of thin, white A4 paper or preferably, white tissue paper so you can cut through the layers easily. 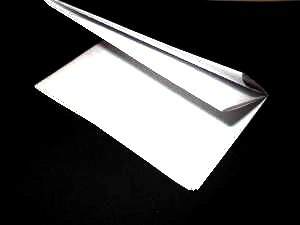 Fold the white paper 3 times so that you have 8 sections. 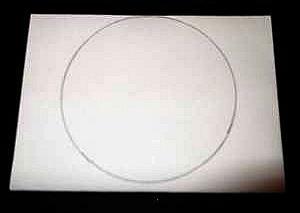 Draw a circle with a compass making the radius 3.5cm and cut the circle out, cutting through all the layers. You should now have 8 circles. 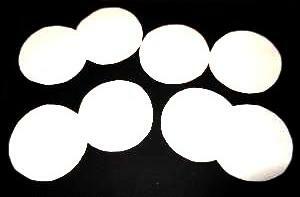 To make a basic snowflake, fold the circle 3 times. Open it to check that you have 8 identical sections and then fold it back up. Now it`s time to get creative! Snow flakes are made up of straight lines, so cut in from the sides towards the center of the folded sections diagonal lines. 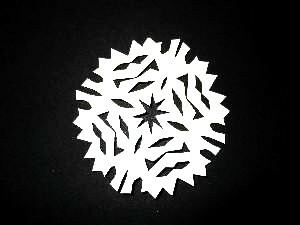 Make pyramid cuts from the pointed center inwards and back again to form a star shape in the middle of the snowflake. For the circumference, cut different straight sided shapes to form a pretty edging. If you find the mini snowflakes hard to do, try making these larger ones. 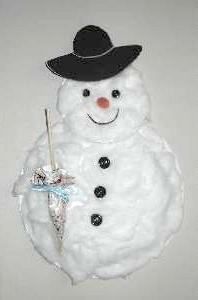 A paper plate snowman is easy to do and fun. You will need 2 white paper plates for this activity and some buttons, cotton wool, a piece of orange and black paper, and a wooden dowel or straw. 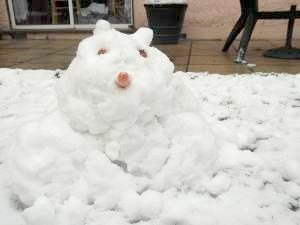 But if the snow comes, you should be making one for real so how about getting some things ready for him while you wait? You will need an old hat, scarf, gloves, a couple of large buttons for his eyes and coat, a large carrot for his nose, and a twig for his mouth. 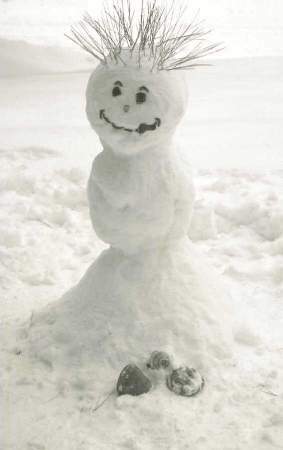 When the snow does come, get out there and have some fun making snow sculptures. Snow is great at sticking to itself. Make a snow ball, squeeze it tight and start to roll it around in the snow. You can make all sorts of animals or things. Anything you like really but do it fast before it all melts. 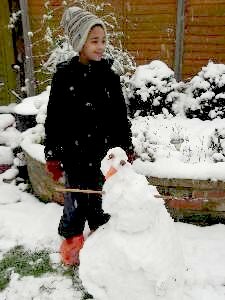 This is Iain with his busy looking snowman 2013 and James made the dog below. Very imaginative! Here are some upcoming winter craft projects to look forward to. You can use the cotton wool for this project, plus green felt material, and glitter. We are going to make a dazzling winter wonderland. We will show you how KKC style! The cold frost paints some amazing pictures on our windows. So let`s copy and make some pretty icicles and frosty leaves to hang there until we get it for real! I am wondering! If you live in a country where snow doesn`t fall, what are your winter months like and what do you like and do at that time of the year? You can also send us in a project so we can learn what other children do. Show Us Your Project - Pocket a Prize! We have lots of Spirograph rulers to give away! How can you get one? Send in a picture of any winter craft project that you have made, and then write and tell us the materials you used, how you did it, and why you love kool kids crafts in no less than 100 words, and your crafty prize will be on it`s way! Don`t worry! That`s only about 5 lines. We had to write 100 lines as a school punishment when we were naughty with nothing to show for it afterwards. 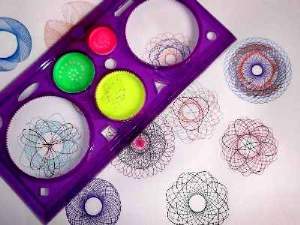 We are sending out these kooool Spirograph rulers to all our winter craft entries. See the entry form at the bottom of this page!